Interpersonal therapy was initially used as an addition to a pharmacotherapy trial of geriatric patients with major depression to enhance compliance and to provide some treatment for the placebo control group (Rothblum et al., 1982; Sholomskas et al., 1983). Investigators noted that grief and role transition specific to life changes were the prime interpersonal treatment foci. These researchers suggested modifying IPT to include more flexible duration of sessions, more use of practical advice and support (for example, arranging transportation, calling physicians); and recognizing that major role changes (such as divorce at age 75) may be impractical and detrimental. The six-week trial compared standard IPT to nortriptyline in 30 geriatric depressed patients. Results showed some advantages for IPT, largely due to higher attrition from side effects in the medication group (Sloane, Stapes & Schneider, 1985). Reynolds et al. (1999) conducted a three-year maintenance study for geriatric patients with recurrent major depression in Pittsburgh using a combination of IPT and high-dose nortriptyline in a design similar to the Frank et al. (1990) study. The IPT manual was modified to allow greater flexibility in session length under the assumption that some elderly patients might not tolerate 50-minute sessions. The authors found older patients needed to address early life relationships in psychotherapy in addition to the usual 'here-and-now' IPT focus. This study corroborated the maintenance results of Frank and colleagues, except that in this geriatric trial combined treatment had advantages over pharmacotherapy alone as well as psychotherapy alone. It is notable that both the Frank et al. (1990) and Reynolds et al. (1999) studies used unusually high doses (maintenance of acute levels, rather than a dosage taper) of antidepres-sant medications, while employing the lowest ever (albeit only ever) monthly maintenance dosage of a psychotherapy. Thus, it is easy to misinterpret the comparison of high-dose tricyclic antidepressants to low-dose IPT-M in these studies. Had the tricyclics been lowered comparably to the reduced psychotherapy dosage, as had been the case in earlier antidepressant medication maintenance trials, recurrence in the medication groups might well have been greater. There were no precedents for dosing maintenance psychotherapy, for which the choice of a monthly interval for IPT-M was reasonable, and indeed somewhat clinically beneficial. For less severely recurrent major depression, or at somewhat higher IPT doses, how might maintenance IPT fare? Learning About How To Defeat Depression Can Have Amazing Benefits For Your Life And Success! 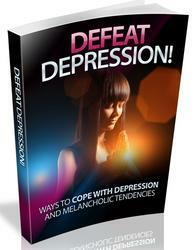 Discover ways to cope with depression and melancholic tendencies! Depression and anxiety particularly have become so prevalent that it’s exceedingly common for individuals to be taking medication for one or even both of these mood disorders.